Lovely All weather rattan set. Perfect for inspiring tropical serenity and relaxation in your Mexican outdoor area. White hot and Lovely! 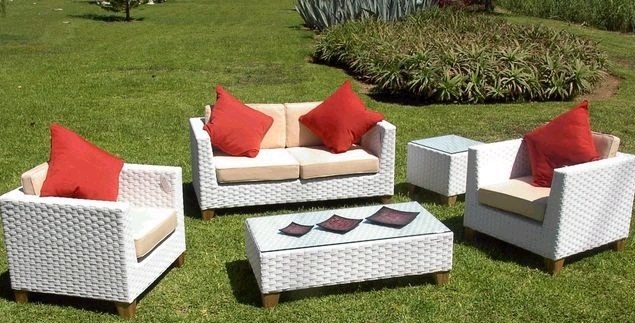 All weather rattan woven by hand. Perfect for inspiring tropical serenity and relaxation, just as its name "La Paz" suggests. Contemporary design in white is perfect for accenting with bright colorful accent pillows. The perfect ensemble for outdoor use in your Mexican patio or garden. Choose cushions in the color of your choice. May be used indoor or outdoors. Set includes love seat, 2 arm chairs, coffee table and side table. Seating for four.